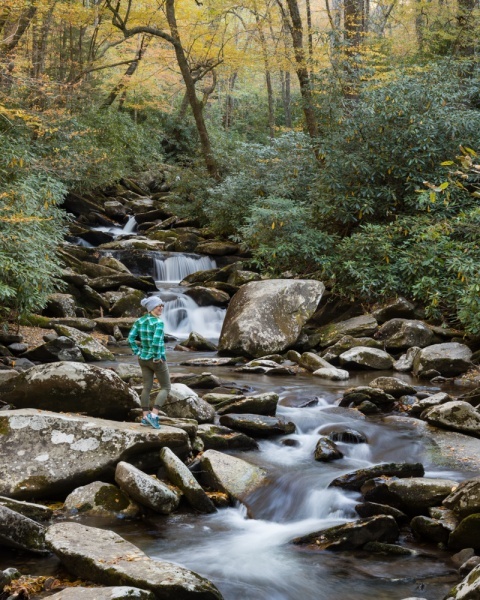 The Great Smoky Mountains National Park is the most visited park in the entire national park system. And for good reason. It has numerous scenic driving tours, plenty of amazing lookouts along the roads, and well-maintained hiking trails that range from easy to strenuous. The month of October is especially spectacular in the park as the leaves are changing from green to vibrant yellow and red. 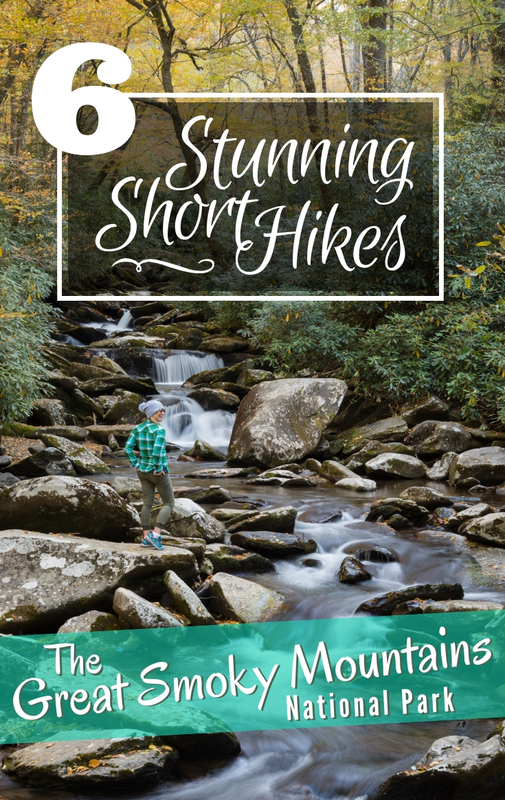 Read on to find out more about our 6 favorite short hikes to do in the Great Smoky Mountains in the fall as well as some trekking basics to help you prepare for your trip! There is no entrance fee to visit the park although the visitors centers are worth a stop to pick up any maps or souvenirs. Practice leave no trace hiking – leave only footprints and take only photographs. Pets are only allowed in campgrounds, picnic areas, parking lots, and along roads but must be kept on a leash. Several areas of the park do not have potable water available. Bring plenty with you as well as a headlamp in case you end up hiking out after dark. Traffic can be a problem in the park. Plan on arriving early or later in the day to avoid the crowds. Take the Gatlinburg Bypass to skip the traffic in town. 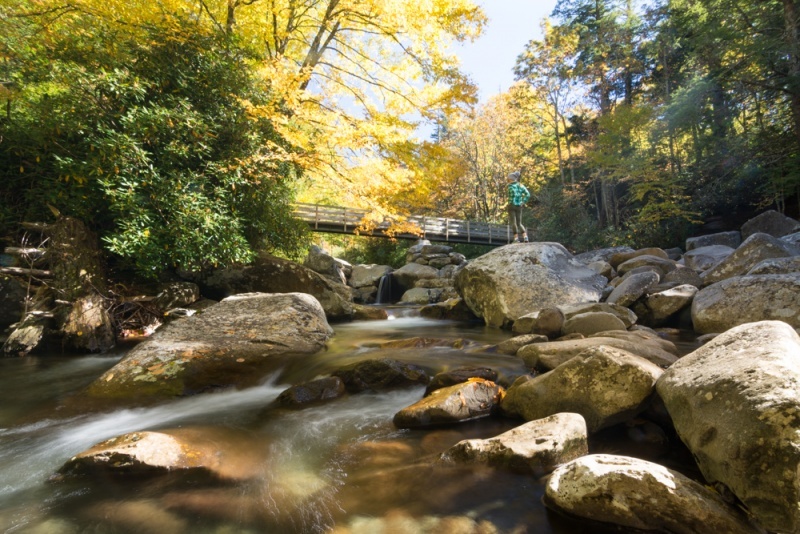 October is the most popular month of the year to visit the Great Smoky Mountains as the leaves are changing from green to vibrant yellows and oranges. Temperatures from September through the middle of November tend to be cool but the air is crisp. Expect daytime temperatures to be in the 70-80ºF range in September, dropping to the 50-60ºF range in November. Autumn is also the driest time of the year in the park. Elevations in the park range from approximately 875 – 6,643 feet and higher elevations tend to be cooler and it can get quite cold after the sun goes down so be sure to bring warm clothing. Weather in the park in the spring can be rather unpredictable, especially during the month of March. April and May generally average 4 inches of rain and March can even see some snow. Summers in the park are hot and humid with afternoon thunderstorms. Expect temperatures in the 90ºF range in July and August. And winters are moderate but it’s not uncommon to see snow, especially in the higher elevations. Be sure to check road conditions if you plan to drive through the park in the winter months. As with any National Park in the US you should always carry enough food and water in your pack, as well as a headlamp just in case you end up hiking out after dark. Added dangers of the Great Smoky Mountains include the presence of curious black bears and a winding road where drivers are often enjoying the scenery rather than paying attention to the road. Most visitors to the Great Smoky Mountains are hoping for one thing – to spot a black bear. There are hundreds of them roaming around in the park so sightings are not uncommon. They are generally not aggressive but, of course, do not feed them or approach them in any way. Willfully approaching within 150 feet, or any distance that disturbs the bear, is illegal in the park. There are also a couple species of poisonous snakes in the park – the Northern Copperhead and the Timber Rattlesnake. Stay on the designated trails to avoid any unnecessary trouble. 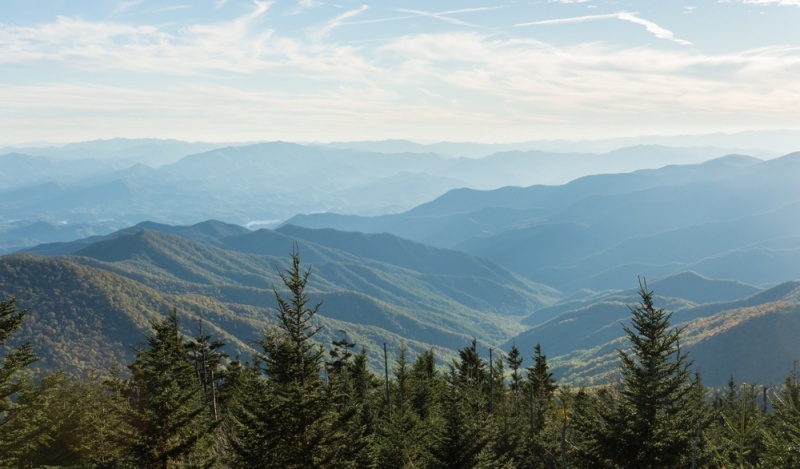 The Great Smoky Mountains is a large, highly trafficked park that requires ongoing trail maintenance, upgrades, and repairs. Especially after the massive fire that damaged several popular hiking trails. 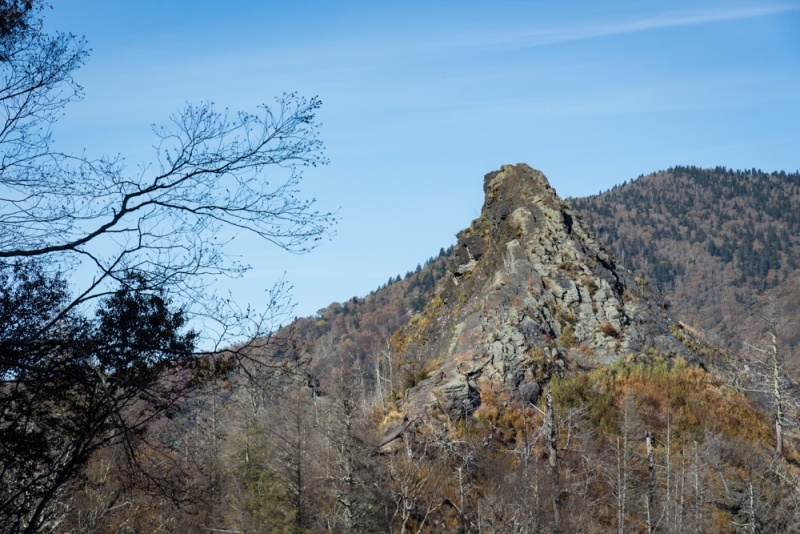 And since Tennessee negotiated a deal with the the federal government stating that “no toll or license fee shall ever be imposed” to travel on Newfound Gap Road, the park will continue to be enjoyed by all, completely free of charge, for decades to come. 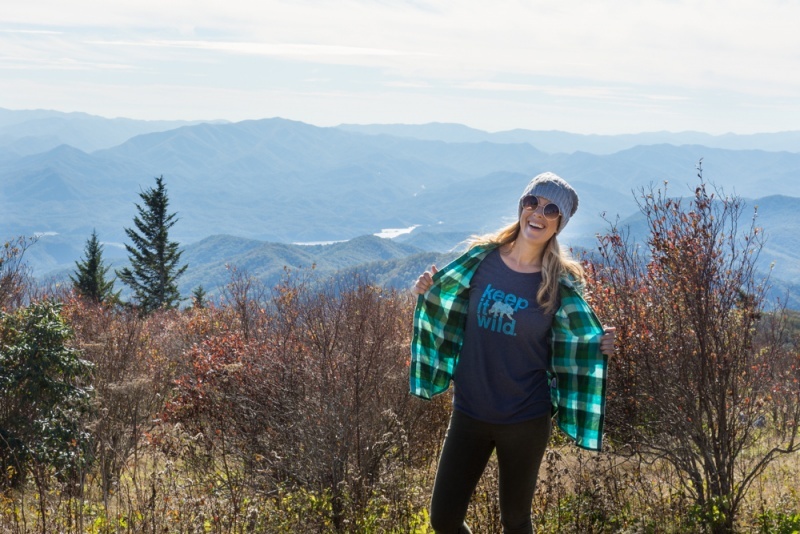 You can help to protect and preserve the park by donating to or volunteering with the Friends of the Smokies. The organization was established in 1993 and has worked on some major projects that have been beneficial to the park and it’s visitors. 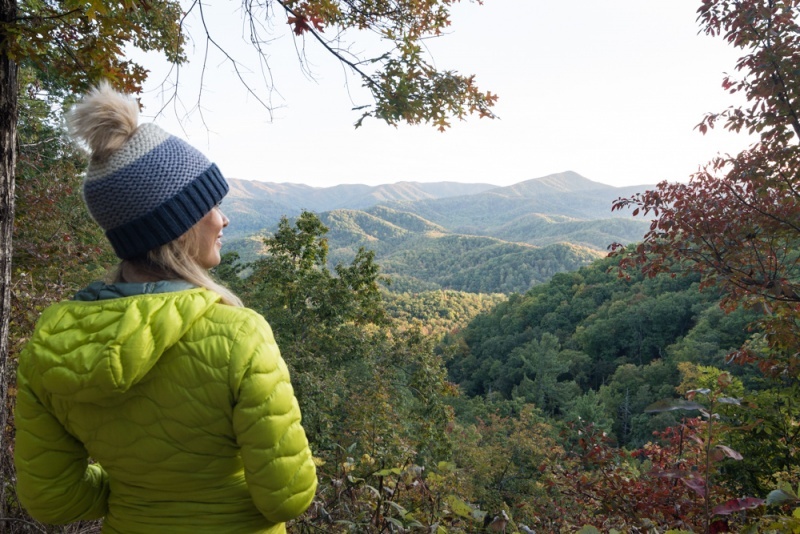 Because the temperature in the park can vary so much by elevation and season, we recommend packing a few extra layers before setting off on your hike. 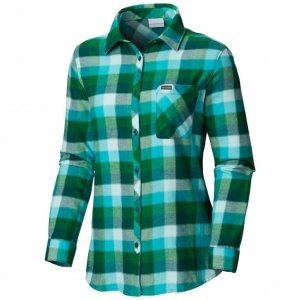 A warm flannel shirt like this one by Columbia Sportswear is perfect to keep you warm when trekking through shady areas. 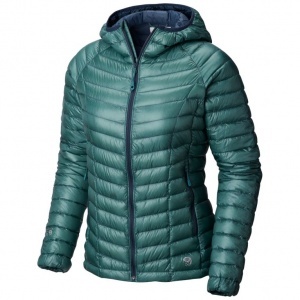 And a lightweight puffy jacket like the Ghost Whisperer Hooded Down Jacket from Mountain Hardware is ideal if you plan on being in the park after dark. At less than 8 ounces, it is super lightweight and can be compressed into its own pocket so it’s easy to throw in your pack without adding unnecessary weight. And the easiest way to keep warm when the temperatures drop is to warm up your head. Keep a knit cap in your pack just in case. 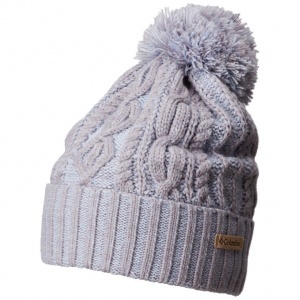 The Blizzard Pass Beanie by Columbia Sportswear is fleece lined for warmth but also cable knit for style. 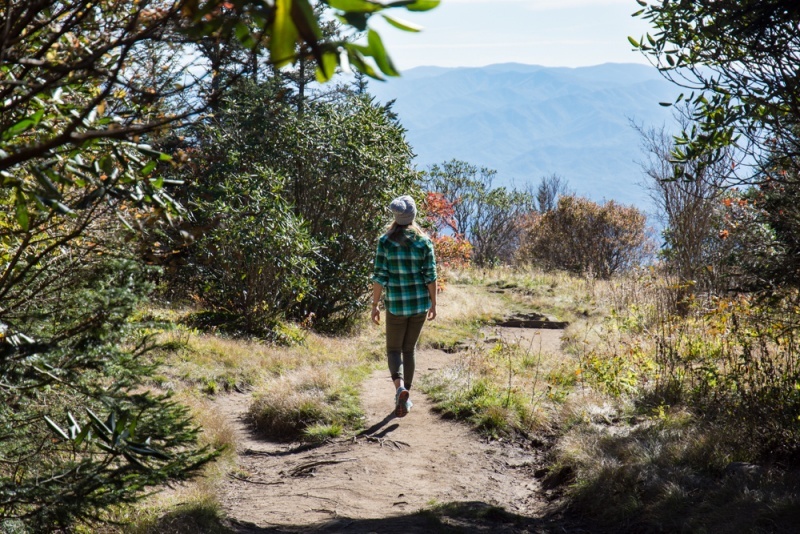 While most of the trails in the Great Smoky Mountains are well maintained, they can be quite rocky or have exposed tree roots coming up from the ground. The trails can also get muddy and slick if it’s been raining. 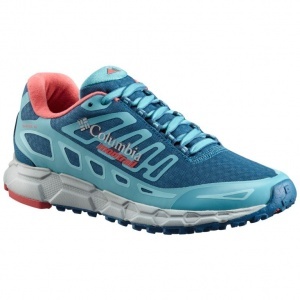 Invest in trail shoes that have exceptional traction like the Bajada III Winter Trail Running Shoe from Columbia Sportswear. Keep those ankles secure (and dry!) 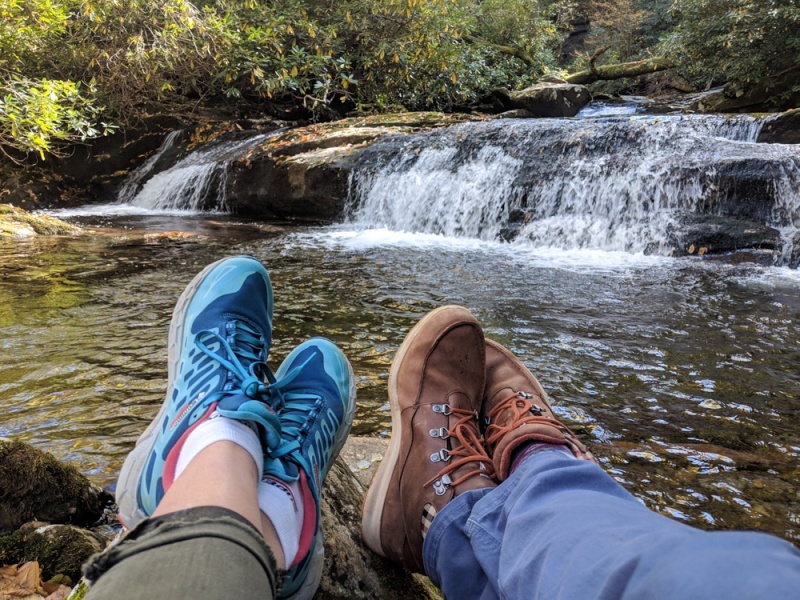 while hiking along rocky and occasionally muddy terrain with waterproof hiking boots with wet-grip traction like the Bahama Boot PFG from Columbia Sportswear. Plus these are actually stylish so you can wear them off the trails as well! The Men’s Roc Flex Pant by Columbia Sportswear are water and stain resistant, making them the perfect hiking pants in unpredictable weather. 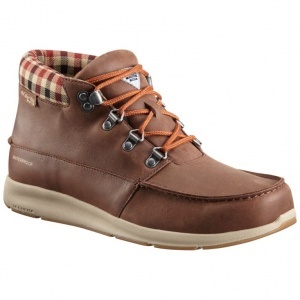 They are also totally versatile and can be worn on the trail or around town. 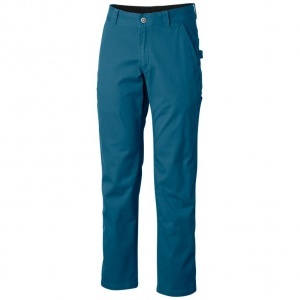 No one will know that they double as your trekking pants. These hikes are listed in order from the easiest to the most difficult. 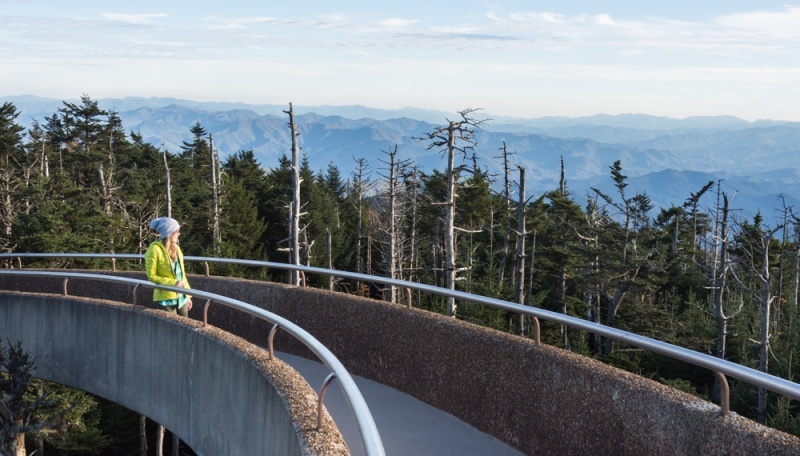 Clingmans Dome is the highest point in all of Tennessee so the views from the lookout are outstanding! The hike to the lookout is a very short but steep uphill climb to the top. It is paved the entire way so any type of footwear will work just fine. A large concrete structure has been constructed so that visitors can enjoy unobstructed views. It gets crowded but is worth sharing your space with a few crying children to see the park from up high. There is a great view of the park right in the parking lot that is popular with photographers vying for the perfect sunset shot. The parking lot at Clingmans Dome is smaller than it should be for the amount of traffic that attempts to park there every day. If you don’t want to wait in a long traffic line or park .5 miles from the lot along the side of the road, plan to arrive early or late in the day. This hike is ideal to pair with the Andrews Bald hike listed below as they leave from the same parking lot. 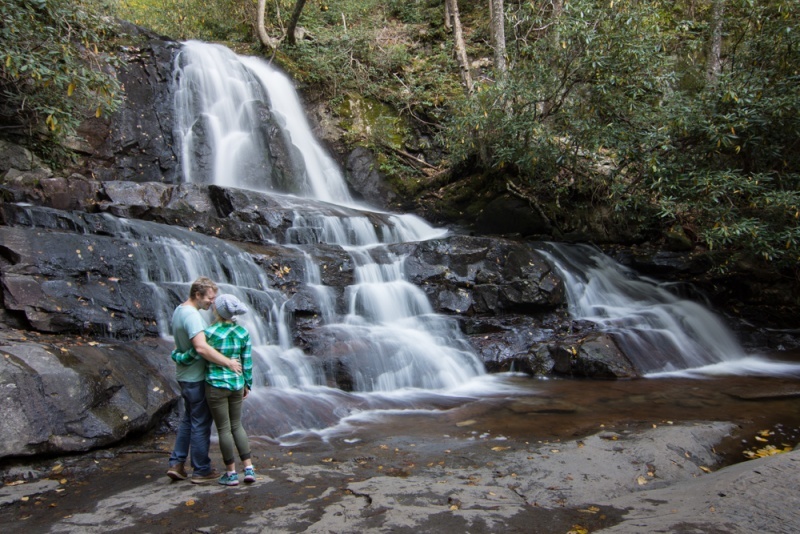 The hike to Laurel Falls is one of the most popular hikes in all of the Smoky’s. The entire hike is paved and it only has a slight incline on your hike in. It is highly trafficked but you will find that you can avoid the crowds later in the day, if you begin your hike around 5:00pm. At the end of the hike you’ll find a small bridge crossing the stream of water from the impressive waterfall above. And off to the left you can stand at the top of another waterfall that cascades down to the valley floor. Be careful here, there are no guard rails and it’s a long way to the bottom. Keep an eye on small children. The hike to Grotto Falls is incredibly popular, well-maintained, and highly trafficked. The path is mostly packed dirt with some massive exposed tree roots jutting out occasionally. From the trailhead it’s a steady uphill climb to the falls but the elevation gain is minimal so it’s good for all ages and fitness levels. 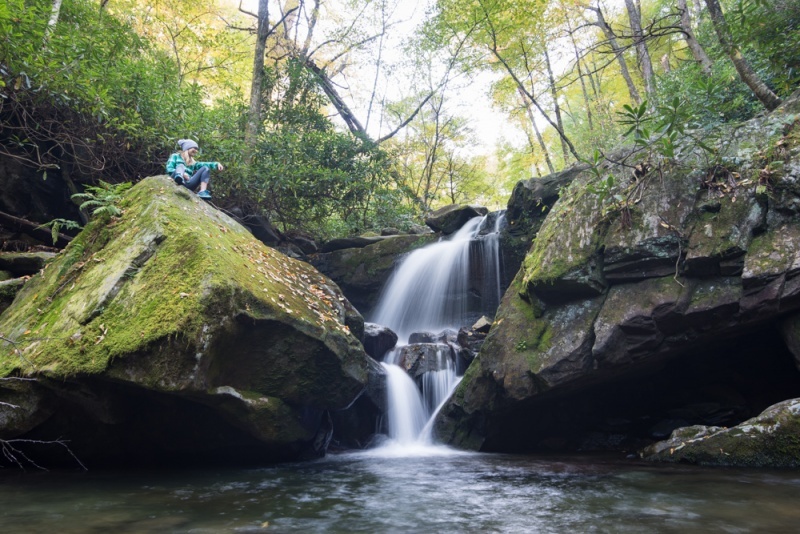 First you’ll come to a small waterfall with a swimming hole at its base. It’s the perfect place to cool off if the weather is nice. And just past it is the picturesque Grotto Falls, a 25-foot high waterfall with a trail leading behind it. You’ll get a bit wet when you pass under the falls but the best area to sit and relax is on the rocky outcropping on the other side. The falls gets really busy so you may have to hang out for a while to get photos without other people in them. Be sure to arrive early, the parking lot is small and you may have a bit of a wait to secure a spot. There are a few areas further up the road where you can pull off and park but since the Roaring Fork road is one-way, you won’t be able to go back to the lot once you’ve passed it. This hike is ideal to pair with the Baskins Falls hike below as they are both along the Roaring Fork scenic drive. This peaceful, rarely trafficked hike starts out fairly flat from the small pull-off on the side of the road. There isn’t a parking lot near the trailhead but there are several spots where you can pull off of Roaring Fork Road. After hiking for 1.3 miles you will see a turn-off to the falls. The descent is steep so use caution. But the 40-foot waterfall at the bottom is certainly worth the short amount of scrambling to the bottom. The trail is rocky so be sure to wear shoes that have some good traction and ankle support if you need it. It’s also worth taking the turnoff to the old cemetery to see the ancient gravestones. 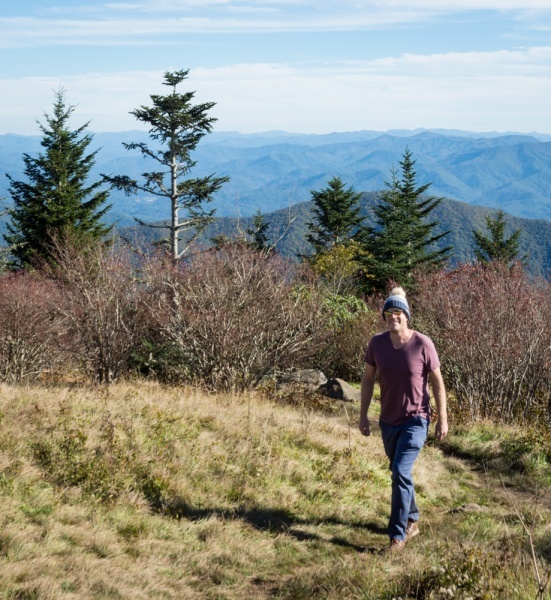 The hike to Andrews Bald is an incredibly well-maintained trail. On the way there you’ll be hiking on a moderate downhill slope so the hike out is a bit more challenging as it is predominately uphill. The trail is rocky and can get muddy so be sure to wear shoes that have good traction. You’ll be hiking through a shady forested area for most of the time until the trees open up to a most spectacular view! Andrews Bald is a clearing where you can enjoy beautiful views of the mountains in the distance while you rest and bask in the sunshine. At the time of writing a brand new viewing platform was in the process of being constructed in case you’re not fond of sitting in the grass. Be sure to bring enough water as the Clingmans Dome parking lot has no potable water. You can purchase overpriced bottled water if you forget. The hike to the Chimneys is short but very steep. The well maintained trail begins with 2 bridges that cross the river below. Hike down to the rocks below to experience the small but beautiful waterfalls and the incredible foliage overhead. Even if you can’t do the entire hike, it’s worth stopping here to visit these picturesque bridges anyway. As you continue up the trail you’ll come to a third bridge and then what feels like an endless series of stairs that have been cut into the dirt. Once you reach the small lookout at the top you’ll be sweaty and out of breath, but you will be rewarded with epic views. About 100 yards from this lookout is a locked gate with a sign warning against going any further. The enormous forest fire that engulfed the Great Smoky Mountains and nearby Gatlinburg was actually started by 2 kids throwing matches at the top of Chimney Tops. Prior to that fire the trail was 2 miles each way and you could scramble to the top of the pinnacles at the end of the hike. But due to ongoing trail repairs, the final .25 mile stretch is closed until further notice. That area is also the only real evidence of fire that you’ll see during your entire hike. The area has repaired itself quite spectacularly. 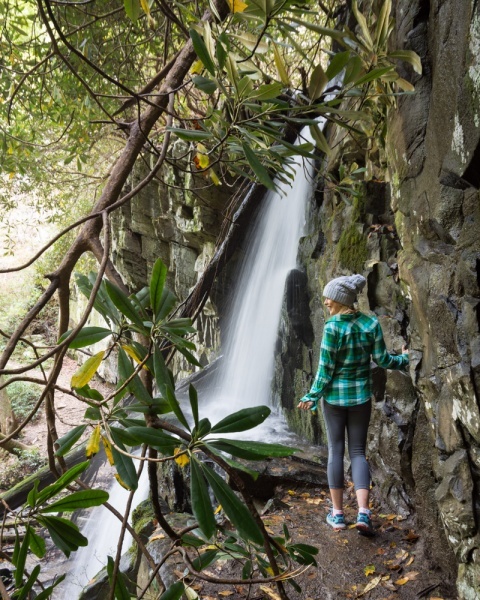 We hope you enjoy trekking in the Great Smoky Mountains! 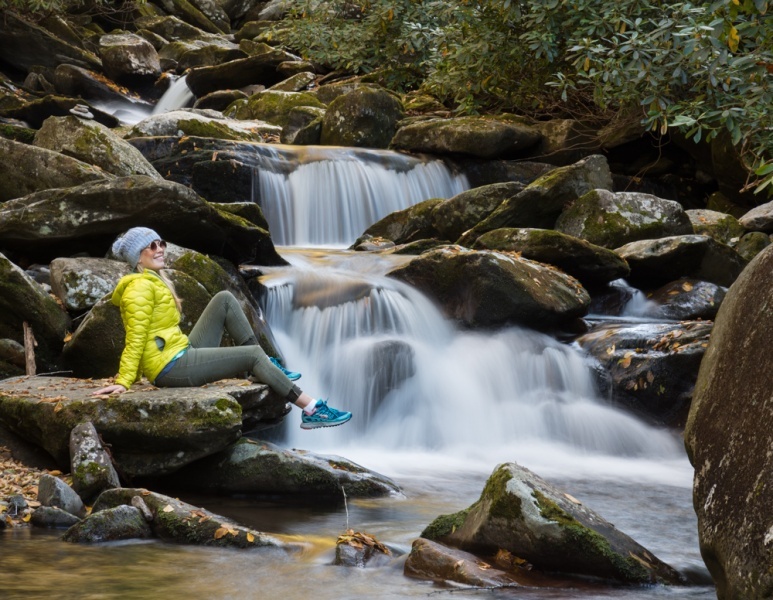 Looking for more hiking inspiration in the Great Smoky Mountains? Check out our favorite books and guides! The Great Smoky Mountain National Park looks like an amazing place to hike. 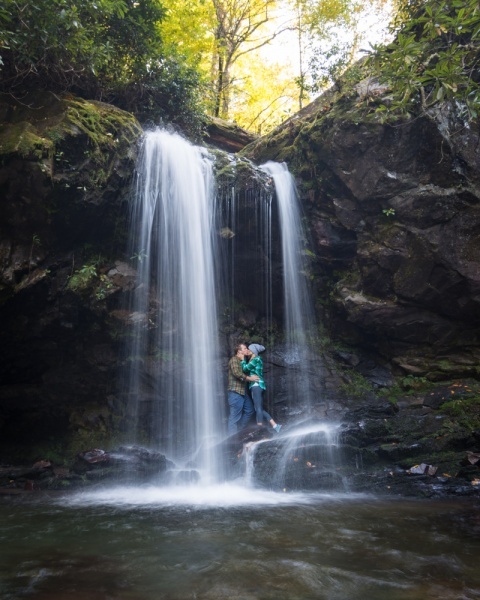 Those waterfalls look fantastic, with so many romantic spots! Autumn seems like the best time to take photographs too. Visiting the Great Smoky Mountains in the fall would be an amazing experience. That view from Clingmans Dome is incredible. I think I could spend a week just chasing waterfalls in the park, your images are gorgeous. We have never been to the Smokey Mountains. But it looks like autumn is a great time to visit. It looks like the weather is more predictable then than in the spring. I do not need a warning to stay away from the bears 😆 Once we bought great hiking boots, we find we wear them everywhere and they almost always travel with us. I think I would love to hike to see any of the waterfalls you have shown. Great to see that they still have lots of running water in the autumn. Thanks for sharing this with us! 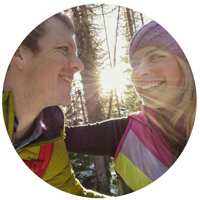 What a complete guide for the hearty hiker. Love the clothes you selected and the shoes look comfy too. I’d love to do some day hiking in the Smokey Mountains. The waterfalls call me most of all. I love hiking in the fall. Clingman’s Dome is so accessible and and beautiful I hear it gets quite crowded. Layering up not only looks good, but it keeps out the sunshine hikers.